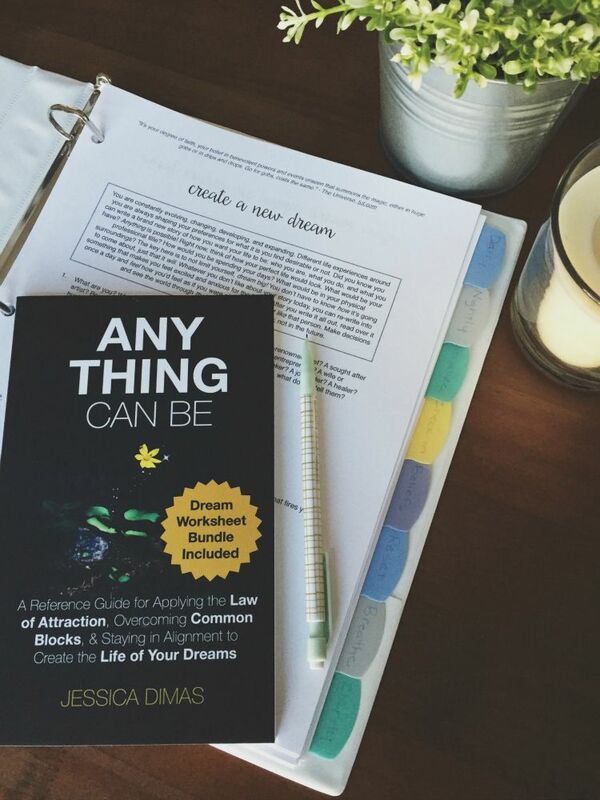 For those of you who have read my book Anything Can Be, you know that I mention in the beginning that I used to carry around a pile of things: a few highlighted books, notes, makeshift worksheets, and journal-like entries. I wasn’t kidding when I said I whittled everything down into these nine worksheets and even my book, so now all I carry around is my binder with my worksheets and my book on the inside. 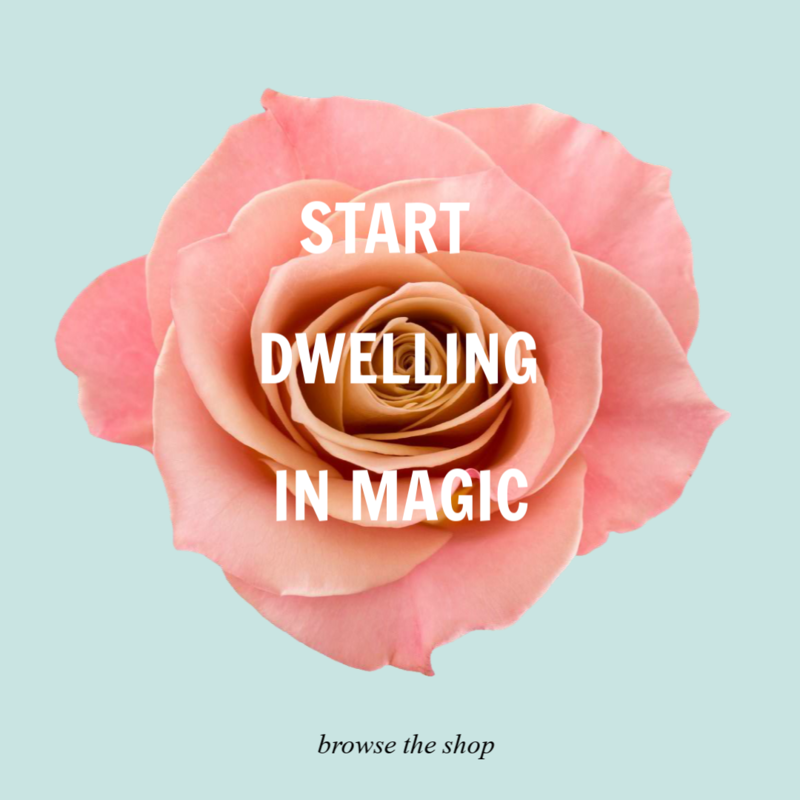 It’s my one-stop dream shop! All I need is right here. I wanted to show you guys how I put my worksheets in here. I print mine out double-sided so that I don’t constantly have to print new ones. 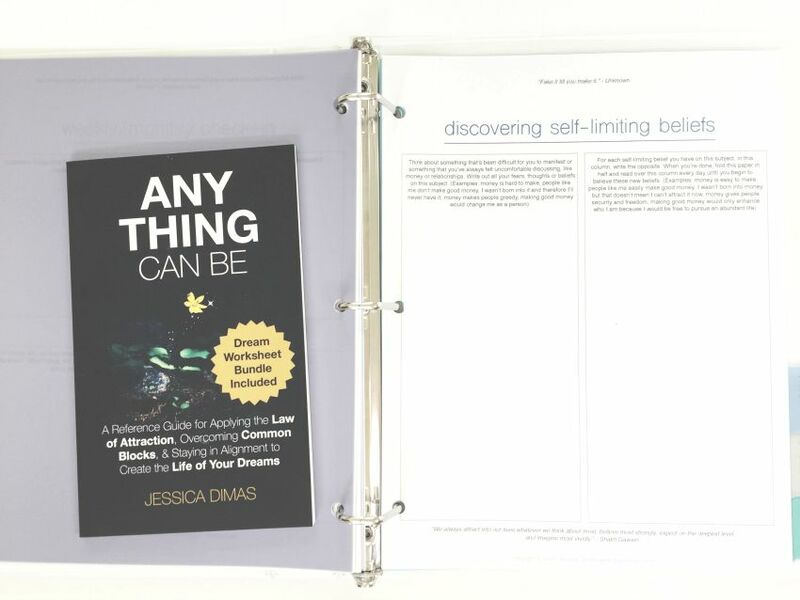 The only one I didn’t do this for was the “Discovering Self-Limiting Beliefs” because I fold that one in half so that I only see my new beliefs when I look at it. I purchased a simple white binder and these pretty dividers to house my worksheets. I print a new batch at the beginning of each month, making more copies for the ones I use most often. Man, nothing excites me more than fresh, blank worksheets just ready for anything new I want to dream up! The order I put my worksheets in goes by which ones I most commonly use. My very first one at the front of my binder is the Let’s Create a New Dream worksheet, which has my most most current vision and goals for how I want my life to be. I think it’s important to have this right at the very front so you see it often and don’t forget. Plus, it inspires all of your other worksheets that come after it. The first four are ones I use often. The last four I use on a needed basis, when I’m having issues manifesting something or when I’m just off and to “recalibrate”. So that’s how I organize this worksheet bundle, it’s quite simple! 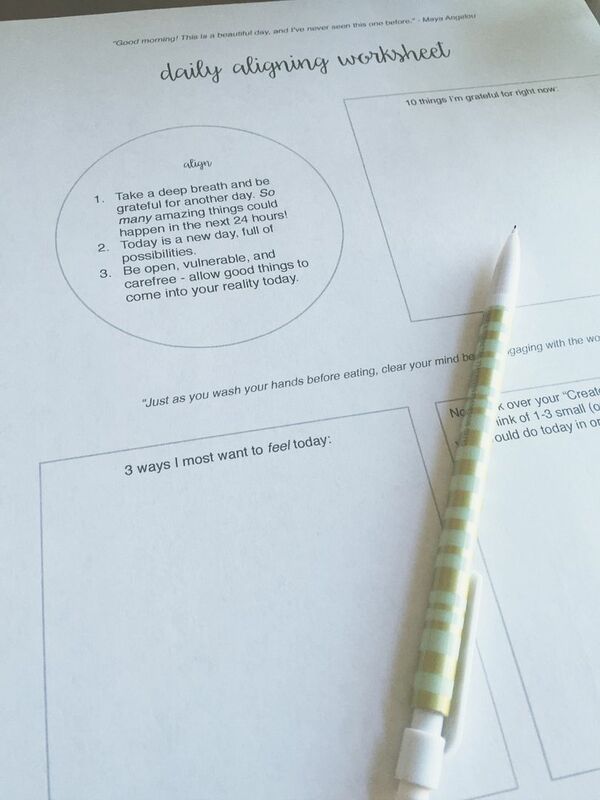 You can read more about my book and the 9 worksheets here if you don’t already have it yet. 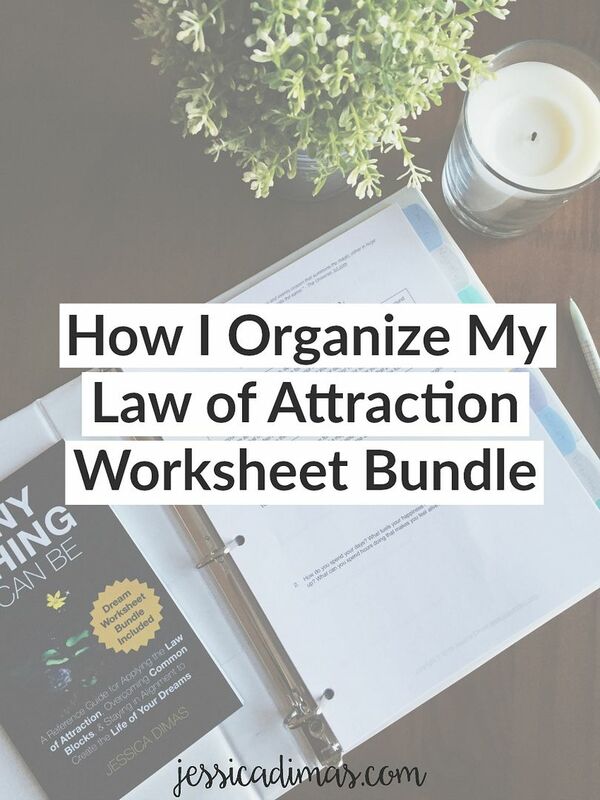 The short version summary of Anything Can Be is that it’s a condensed reference guide for the law of attraction, and the 9 worksheets that come with it are for applying the law of attraction to your life. 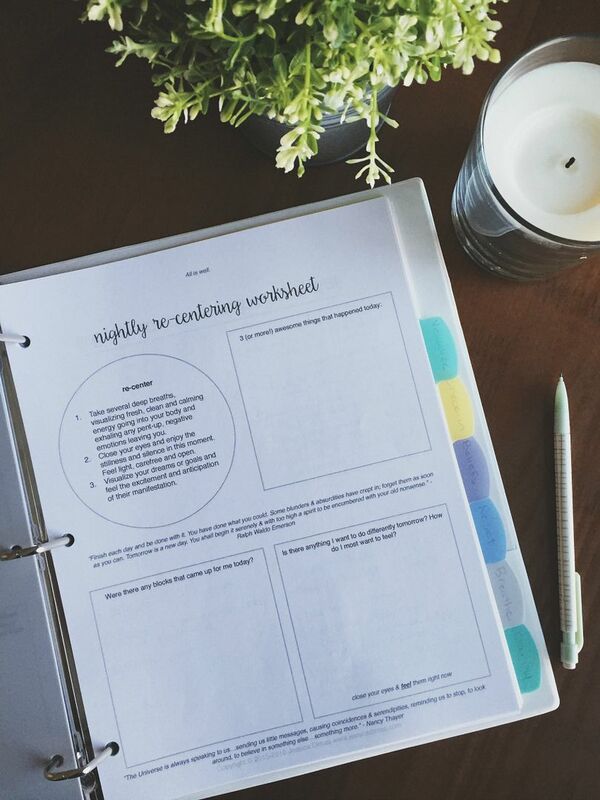 I tend to be an “out of sight, out of mind” type of person so I created the worksheets as a way to help me remain focused, intentional, excited, and in alignment!